Holmes County Hospital and Clinics (HCHC), a part of University of Mississippi Medical Center, is a 25-bed critical access hospital located in Lexington, Mississippi. Services include acute care, emergency services, level IV trauma care, telemetry, outpatient services, swing bed program, and outpatient psychiatric program. The goal of the hospital is to serve the community by providing affordable services that improve health. 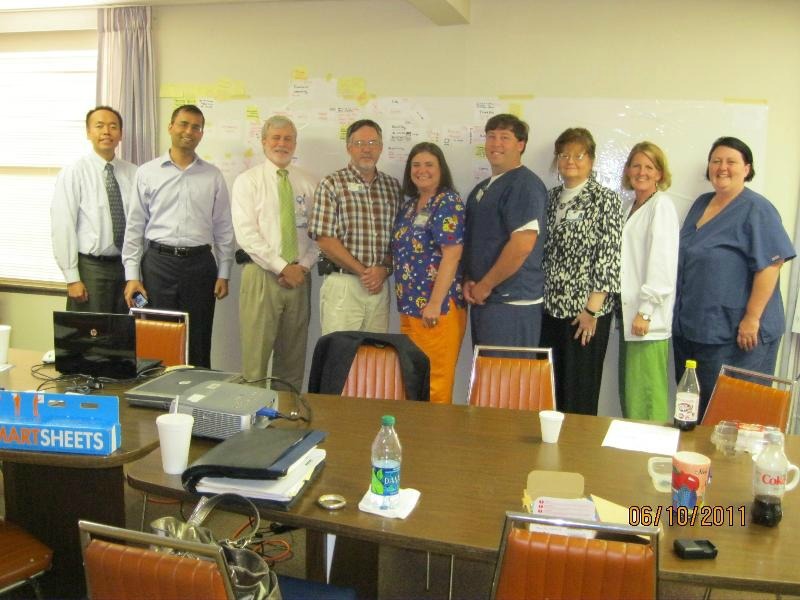 In FY12, Ravi Lote, PMC Corporation, began working with the hospital leadership team on a Lean Process Planning and Value Stream Mapping project. The project team chose to focus on streamlining processes in the emergency department to improve patient flow and increase patient satisfaction. Phillip Grady, CEO, and Paige Lawrence, Clinical Director, shared the following information with RHPI concerning the progress of this project. Q: Why did you choose to focus on Lean and the Emergency Department (ED) for your RHPI project? A: To introduce lean to our organization and to improve effectiveness in the Emergency Department. As a small facility without a large staff, using Lean techniques can generate many opportunities to increase efficiencies and reduce wait times. Q: What is your hospital's current status with regard to implementing the recommendations made during this project? A: The hospital decreased overall wait times significantly in the beginning. Six months into implementation, we went fully live on an EMR from a paper record. Initially, our total wait time moved back up some. This is not unexpected and we believe wait times are better than they would have been after implementing the EMR if we hadn’t done the Lean project. There were also many staffing changes during the time of EMR implementation. Again, if we hadn’t completed the Lean project, just getting new staff on board would have affected the process more. In the near future, the ED will be renovated eventually and Lean process was included in the planning of the renovation. Physicians are more on board and better understand how they impact the overall wait time. Communication with physicians, radiology, and department to department is better. We continue to maintain awareness of this project in the hospital since the wait times are reported in employee, leadership and board meetings. A: Average Length of Stay (ALOS) for “treated and released” went from a baseline of 143 minutes to 125 minutes in the first quarter after the project and presently is at 138 minutes. ALOS for admitted patients went from a baseline 203 minutes to 172 minutes and presently is188 minutes. Time to Medical Screening baseline was 50 minutes and decreased to 41 minutes. Presently it is at 47 minutes. We also worked to affect patient satisfaction and looked at two questions. “Are you satisfied with the wait time before seeing a provider?” had a baseline of 59% and improved to 80%. “Would you recommend Holmes Hospital to other patients?” had a baseline of 72% and after project, was at 84%. A: After implementation of EMR, wait times have increased some. The next focus will be on bringing those wait times back to post-project/pre-EMR times. Q: Is there anything your hospital would do differently if you were able to repeat this experience? A: No, there really isn’t anything we would have done differently. A: The biggest impact has been the renewed focus on the patient and patient-centered care, and not getting distracted by our own tasks, but instead remembering we are doing this for the patients. There has also been better collaboration and ownership of different departments regarding patient flow. Communication among departments and with the physicians is better.